Bihon (Tagalog) or bee-hon (Chinese, Singaporean, Malaysian) or rice vermicelli (English Term) is a rice noodle variety that is common in most Asian counties. It’s actually one of the staple foods next to rice in countries like China, Singapore, Malaysia, Indonesia, Myanmar, including in the Philippines. In the Philippines, this is one of the Chinese influence in our cuisines. We haven't actually cooked bihon guisado or any Filipino style bihon recipe since we came to Singapore. We've been cooking bihon but usually we follow other Asian cuisines. 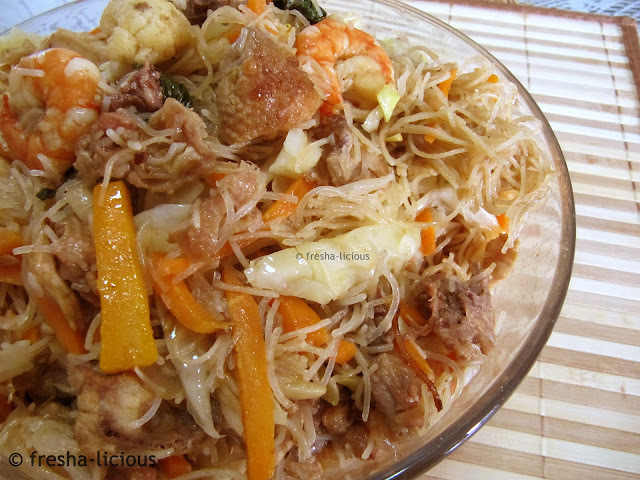 We'll be trying to cook Filipino style bihon soon when I have the appetite for it :-). This recipe is not ours, it is actually Alma’s (Airene’s helper). Bihon - 300 to 500 g.
3. Add the the shrimps and simmer until it changes in color. 4. Add the water, soy sauce, and chicken powder. Bring to a boil. 5. Put the rice vermicelli and simmer it until the noodles are cooked. Add the vegetables and let sit for a minute then remove from fire .